This past year DC Energy partnered with the King Street Center to install a solar array on the roof of their newly renovated building in downtown Burlington. The new renovations were designed to maximize efficient use of the small lot where the building is located and to provide maximum energy efficiency. As part of the renovations included a rooftop sports/play area, there was limited area remaining for a solar array. To provide a system with some capacity, solar panels needed to be located where they would not receive ideal sunlight, especially in the winter when the sun is low in the sky. The system was designed using an optimizing system where each solar panel can perform at its best. This helped mitigate the impacts of system shading. 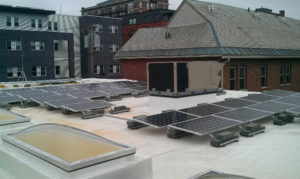 DC Energy also designed a means of electrical connection for the solar array so that the King Street Center could get maximum economic benefit from their solar array. We are happy to help such a great organization go solar and reduce their electric costs – leaving more funds for their real purpose – supporting our children!